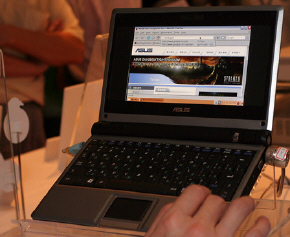 I just ordered an Asus Eee (4Gb, black). The OQO 2 might have been nice, but at £229 inc. VAT and delivery, the Eee is some £800 cheaper, and thus less likely to invoke worries about theft or damage. Once I have it set up, I’ll blog about the potential of the Eee as an ebook reader, and on how it works with digital projectors in the classroom. I ordered from Clove Technology on the South Coast of the UK, since Amazon UK‘s site didn’t seem to have a clue what an Asus Eee is. … and as they sell by the truck-load, doubtless a huge mod scene will develop, not only in the O/S and software, but also for the cases. 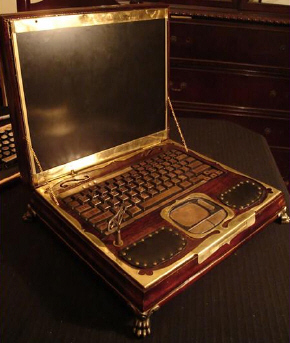 I’m already thinking that I may want a tough book-like case with a flap that folds over the keypad to obscure all but the required buttons for using the pre-installed Adobe Reader and FBReader with ebooks. Oh, and talking of new boy-toys; for those who were wondering how I’m getting on with my new 24″ flat-panel Dell monitor after a month of trying it out, it’s wonderful. There is an annoying colour-shift in JPEGs when I hit the “Save for Web…” option in Photoshop , but that’s the only annoyance so far. And doubtless it’ll be curable over Xmas, when I’ll have time to tinker with streamlining the colour profiles and suchlike. The Dell’s widescreen is especially suitable for reading e-magazines and e-books in the familiar “see two pages at once, side-by-side” mode.